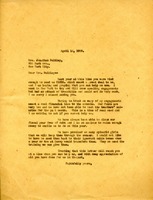 Martha Berry writes to Mrs. Bulkley that she is hoping that she can help the school once again. The Berry Schools has always been able to be without debt she says and hopes that the school can maintain that with help from Mrs. Bulkley. She explains that she has promised many boys and girls that they can stay through the summer and she doesn't want them to have to go back to their cabin homes in the mountains.